- key combination (hold) Ctrl+A. If picking an object selects only one object at one pick, you can select more objects at once by using window selections. A window is defined by two diagonal points; like drawing a rectangle. There are two different ways of selecting more objects using window, and by doing this you should never click on an object line; of course, then it would be a pick selection. Draw a window from left to right. All objects inside the window frame will be selected. Draw a window from right to left. All objects inside the window frame, the ones which window frame crosses or simply touches will be selected. You can select object using a line or a fence. When prompted to select objects, type [F] for fence and simply draw a dashed line across objects you want to select. All crossed and touched objects will be selected. If you made a mistake and selected an object you don’t need, don’t cancel command and start over. Just press Shift key and select an object you want to remove from your selection set. If you want to modify the same objects simultaneously using different commands or you cancel the command after you selected objects, you don’t have to reselect objects all over again. When prompted to select objects, type [P] and previous objects will be selected. You can also easily select an object that you have created last by drawing or copying, etc. When prompted to select objects, type [L] and your last created object will be selected. If you erase last object in the meantime, the one that was created before it will be selected. You can quickly add the selection of objects that are similar to the one you´ve selected. 1. Select an object in your drawing, e.g. text. You can determine which properties objects must match. 2. 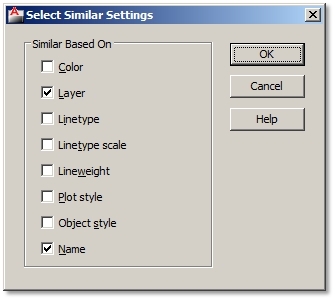 Specify the Settings [SE] option to Select Similar Settings dialog box. 3. Select properties to be matched. 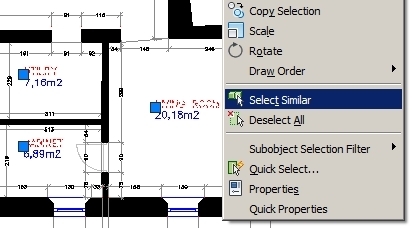 At first glance Select Similar and Quick Select give the same results, but Quick Select offers more possibilities when selecting a certain set of objects. You can apply filter criteria to the whole drawing or just one area, then to various objects, their properties and values. 2. Apply to – define selection area, e.g. 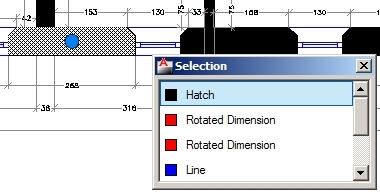 entire drawing or select object to filter from. 4. Operator and Value – select an operator, like equals, not equal, greater than/less than or select all. For example, if you choose circle and radius property, you can filter selection to circles with radius greater than a given value. If many objects overlap each other, it might be difficult to select the one you need. The old way to activate cycling through selection of overlapping objects by holding Shift key, pressing Spacebar and click on overlapping objects still works. However, AutoCAD 2011 made this procedure much easier. 2. Click on overlapping objects. 3. 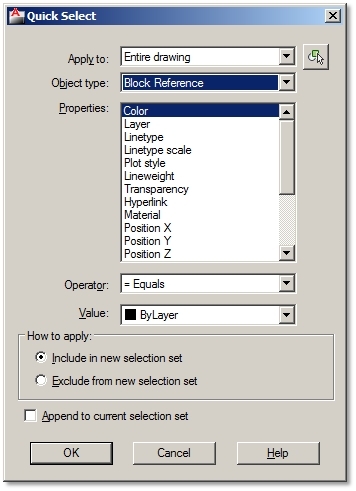 Select desired object from Selection menu. You can easily recognize your overlapping object in the drawing as it gets highlighted when you hover over its name in the Selection menu.